Italcinte: Interview with Beniamino Bugiolacchi and daughter Patrizia who is now the Manager of the company. Q: Your business exists for over 100 years. Please tell us, how you felt when you were young being surrounded with this manufacturing? A: Beniamino - Already when I was very small (4 years) I knew, that in this area one was working! and there were my parents, my brother, my aunts and some workers. Me – I was the little boy – running around in the laboratory "trying" to help and many many times, right after the war, one would work until late in the evening. As I was a quite an active and lively boy, the family decided to put me into the college in Macerata. In the meantime, my brother had enlarged a bit the horizon of local production and had managed to sell straps for guitars to big companies like Gibson and Fender, which has brought quite some fame to the manufacturer Italcinte. Of course I had a big pride, when I saw our products being used by famous names – such as the Beatles, Jimmy Hendrix, Rolling Stones, Bee Gees etc. Never the less, even with this success by the company – I had decided to study CINEMA in Rome. I loved Rome, I love the "Dolce Vita" with important actors and actresses! After only 6 months of dolce vita, my brother got an excellent job offer in 1968 at the company Elka and my father ordered me to come back and join the factory! My passion for Cinema was still very alive and during a festival here in Castelfidardo, of which I was the artistic director, I brought all the actors I met in Rome, here to Castelfidardo, which gave me great satisfaction. Q: When did you get involved with the accordion business? A: Of course, I could not avoid the contact with the accordion and accordionists…. and my real first contact/approach was with the famous Maestro Bio Boccosi and Gervasio Marcosignori. Q: What have you 3 been up to? A: Yes – full of interest "to do", we have started to organize the first exhibition of musical instruments in Pesaro – and we did it! – right here! – where I am sitting now! – in our Italcinte manufacturing office in Castelfidardo. This was organised from 1979 until 1993 and was the only musical instruments exhibition in Italy. Q: Have you always been working only here in the factory? A: Yes – but I had many other occupations, such as collaborating in the 1980s with the local region of commerce/Ancona making me one of the people responsible for international accordion exhibitions in countries like Japan, USA, Brazil, Germany etc. Q: When did you take over your family business? A: While my father was alive, I was responsible for the customers and the accoounting and for the rest, I was travelling to various exhibitions, like to the famous Frankfurt Musikmesse since 1967, which was also the time that I took over managing the Italcinte manufacturer! Nearly 40 years…. yes – many times I believe existing over 100 years, producing only accessories – it seems like a dream, but I know, only hard work, a bit of luck and a lot of enthusiasm for my work, has led us to this point of still existing after so many years! Q: Did you have also other interests? A: Yes – politics! 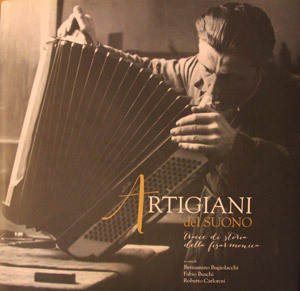 In 1980, I became councilor and collaborator with the Mayor of Castelfidardo, and at that time, I became a founder of the Accordion Museum Castelfidaro. Q: We know, that you have always been interested in the history of the accordion…. How did your great interest in accordion history begin? A: Working so closely with Bio Boccosi and Gervaiso Marcosignori, I realized, that there was really no history of all the artisans of Castelfdiardo. Founding the museum – I first wanted to start collecting the evidence of the history of the accordion and only afterwards to document it. Q: We know, that you were also editing articles and information in Magazines….and holding conferences! A: Yes – I was writing regularly for the magazine "Strumenti e Musica" which was owned by Bio Boccosi and for the German Magazine "Das Musikinstrument" or holding conferences/seminars such as "Italian Traditional Music" in the „Citée du Musique“ in Paris (2000). Q: What other important experiences were you involved in? For instance my travel in 1976 to Moscow. When I had the pleasure of meeting Friedrich Lips, Viachtselav Semionov and bringing them the first time myself to Italy and at this time, they were not famous yet! I met many many important persoanlities in the accordion world – customers, that were not only customers, but became also friends – such as Faithe Deffner from USA. My first experience as a compere was in the theatre Astra, when Harley Jones and his brother Maurice Jones would perform in concert. Q: So – you are many years in the world of accordion….do you see any changes? A: 50 years in this wonderful world with accordions….but now I have the feeling, that I need a change! My last exhibition with the title "hands of knowhow" is just in this very present period, in several cities of the Marche region. Q: Do you have traces of things you do/did? A: Laughing – yes….an amusing question….as I have a huge archive of ALL the things I do/have done. This includes thousands of LP’s, CD’s amounting up to about 14,000 pieces, books, photographs… historical papers, first invoices of 100 years ago…. sooooooooooooooo many many things! Q: Why did you collect all these items…. for interest in music, for interest in collection….. for history? A: "all" of the things…. but mostly, because I got aqainted with many important singers of the metropolitan opera of New York and of course also from Italy. Q: Now, a change has been happening also in the company Italcinte – as your daughter Patrizia has taken over the business from you (her father Beniamino), so we also want to ask her, if she too, was in the factory from her earliest years of childhood? A: Patrizia – Yes, me too – I have been in the factory right from being a very young child, just as my sisters did and now also my son! Q: You are in this factory since nearly the beginning of your life – do you intend to remain within this place of history and craftmanship? Yes – it belongs to our history – to us. We are producing only hand made items and there is no necessity of big places. We have chosen to retain the original and traditional ways of production. Q: Patrizia – what do you like best about your work – this manufacturing process? A: My biggest joy is, that I start with a single piece of leather and create and craft it, so that in the end we have a finished product, that will please so many artists throughout the world. Q: Italcinte is known worldwide with a superb reputation for its high quality accessories… Does this somehow interfere with your work in regards of pressure? A: Of course things have changed throughout the years. The materials have changed and sometimes it is hard to maintain quality as materials are no longer as they were, once upon a time. But we try very hard to guarantee and maintain our long lasting history of 100 % hand made accessories exclusively made in Italy and all items are certified to be 100 % italian products. That top quality hand manufacture gives us great satisfaction.